one crumb at a time: Ode to the Aubergine. Luis Meléndez is one of my favourite still life artists and so I wanted one of his works to illustrate my Ode to the Aubergine. Unfortunately in this instance he seems to be more interested in the tomato. What does please me about this painting is its simplicity - the plain wooden table, the rustic pottery bowl, the feeling that these vegetables have been plonked down on the kitchen table ready to be sliced up for the next meal - and the way the subject fills the field of vision and focuses your attention. 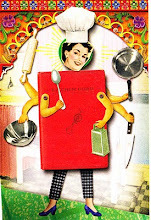 Meléndez painted the ordinary things of everyday life, the fruit and vegetables and kitchen objects he would have found in his kitchen at home. Neither the tomato nor the aubergine is native to Europe. Tomatoes were brought back from the New World by Spanish and Portuguese explorers. Unusual both in appearance and taste, and a member of the suspicious nightshade family, the tomato didn't become generally acceptable in gastronomy until the 18th century. Aubergines, also nightshades, originated in India and travelled along earlier trade routes, certainly coming to southern Spain with the Muslim occupation if not before. 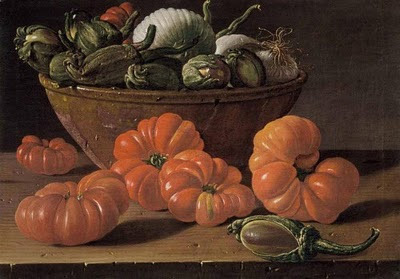 Meléndez painting suggests that the artist probably liked his food and knew that aubergines and tomatoes and onions were made for each other, with the implication also that by this time (the 1770s) these ingredients were no longer unusual. Thanks to the way he brings his subject to life, when you look at this painting today you don't just see what Meléndez saw but you can almost taste what he tasted. The stars of the show, the tomatoes, with their wonderful rich colour and their glorious sheen promise intense flavour while the hoary, prickly calyxes of the aubergines hide their contents suggesting that there might be hidden pleasures inside.The onions are subordinate but have a significant role both in the structure of the painting and the flavour of the dish to be prepared. What interests me too is that some 240 years after Meléndez arranged this composition all the ingredients are still immediately recognisable for what they are, albeit that the deeply ridged tomatoes are now what we would call 'heirloom' and the aubergines look small and undernourished compared to the commercial varieties which we are picking from the garden at the moment. Hence my Ode to the Aubergine. The plants themselves are lush and robust with big, lobed, slightly downy soft green leaves and small unassuming purple flowers. They have been so easy to grow - seemingly oblivious to any sort of pest or disease (although one or two have succumbed to sunburn) and existing on minimal amounts of rain. Everyday I pick more of the fruit, heavy and tight in their skins, so shiny they look as though they have been polished and a deep purple-black like no other colour. And we have eaten them in every form you can think of, dishes with exotic names to do justice to the exotic appearance of the fruit - smokey baba ghanoush style dips, parmigiana di melanzane, tian d'aubergines, ratatouille, caponata, imam bayildi, moussaka, melitzanes papoutsakia, baigan pachchadi and the cupboard is stacked with jars of kasaundi. I've fried them, grilled them, baked them, barbecued them; sliced them into rounds, sliced them length ways, cut them into cubes, scooped out the flesh and stuffed them, and still they keep coming. It's tempting to think of the poor aubergine as a cross between Jack's bean stalk and something out of The Sorcerer's Apprentice. On the other hand when struggling with what to feed the family there is great pleasure in knowing that there is always something in the garden to provide inspiration. From me the aubergine gets five stars - good to grow, good to look at, good to cook with, good to eat and good to share. My Turkish friend Haluk turns 50 today and his gift will be a bag full of freshly picked aubergines which I know he will appreciate and put to good use.